Great Peninsula Conservancy volunteers experience the great outdoors while exploring their neighborhood and making new friends. Are you ready to get your feet wet? Here are a few ways to get involved. 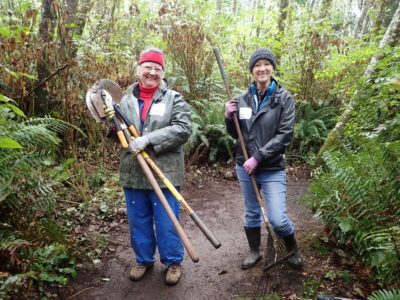 If you are ready to spend some time outdoors and get your hands dirty, become a stewardship volunteer! 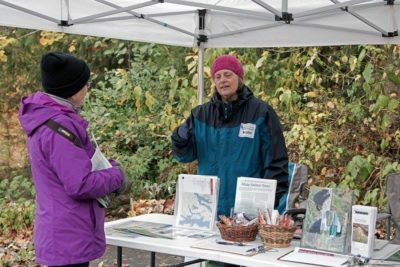 GPC sponsors several stewardship events a year across the peninsula. Visit our events page to see upcoming opportunities, or if you are interested in property monitoring, head here to find out more about becoming a land steward. GPC hosts several member events throughout the year from walks and talks to our annual Spring Dinner, and we can always use a helping hand. Check out our events page and then contact us to find out more details about how you can get involved. We are a small staff and from time to time we need extra assistance in our office doing tasks that range from envelope stuffing to preparing packets and filing. If you prefer to keep your feet dry and work inside, contact us for upcoming ways to help.